Acer saccharum, Actea pachypoda, Adiantum pedatum, Agrimonia pubescens. Anemone virginiana, Aralia racemosa, Carpinus caroliniana, Cornus alternifolia, Cornus racemosa, Eupatorium rugosum, Hepatica acutilobia, Ostrya virginiana, Quercus rubra, Rhus radicans, Smilax ecirrhata, Solidago flexicaulis, Solidago ulmifolia, Staphylea trifolia, Ulmus americana, Vibrunum lentago, Viola sororia. MA west to NY, OH, IN and MO, south to SC, VA, and TN. Herbaceous, poisonous perennial to 2.5 m. Leaves ternate and then pinnately single or doubly compound; leaflets rotund to oblong, coarsely and sharply toothed, mostly less than 10 cm long, cuneate to cordate at the base. Flowers foul-scented, in long, branched, slender racemes to 80 cm long; sepals petaloid, white, 5 mm; petals absent; stamens 8-10 mm; staminodes present, oblong or oblanceolate, 2-3mm; ovary usually 1, sessile; style stout; follicle firm-walled. 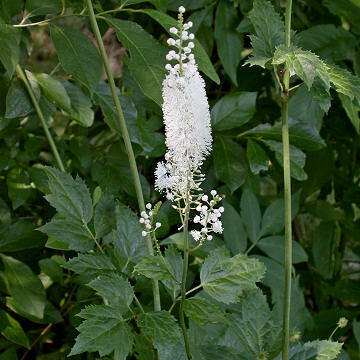 A showy plant, the flowers stand out in summer woods.